Esther Hecht always wondered about happened to her parents after they were picked up by the Nazis and she never saw or heard from them again. She assumed they had perished in the Holocaust just as 6 million other Jews had. Now, so many years later, she wants to visit her son in Amsterdam and attend her grandson's Bar Mitzvah, but she also wants to see her long time friend Helena. After the Bar Mitzvah, Esther, her son and grandson, Daniel begin their trip into her past. As they travel, Esther begins to tels Daniel about her experiences as a Jew in Hitler's Europe. When Hitler rose to power in Germany in the 1930s, life became very difficult and dangerous for all the German Jews living there. But after Kristalnacht, young Esther's parents decided to leave and move to the Netherlands. There, Esther became friends with Helena, a Christian girl her age. They both had crushes on Bob Canter, a handsome boy who lived in their apartment building. Things went well for Esther and her parents, until the Nazis invaded Holland. Esther and Helena remained friends, but life became harder and harder once again. After her parents were picked up in a raid one night by the Gestapo in Amsterdam, young Esther is warned by Helena's father to get away. She went to a friend of her father's who helped her find a place to hide. There she met other Jews also being hidden, and is taught farm chores by the farmer's son Barend. One day the Nazis came but Esther managed to get away. As she runs, she hears shots being fired but doesn't know if anyone was hit. Barend is the first person Esther and her son and grandson visit and he fills her in on what happened after she escaped. After wandering around the forest for a while, Esther found people who welcomed her and she remained there until the end of the war. Returning to Amsterdam to look for her parents, she ran into Bob Canter, her old crush now a concentration camp survivor. Bob tells her that her parents both died in the Holocaust. Eventually, Esther migrated to the United States and lost touch with Bob. Esther's grandson looks Bob up and finds him living in Israel. A few days later, they are on their way to visit Bob, who fills in all the blanks about her terrible parent's fate, a story well worth reading. Feeling like she has now really lost her parents and her past, Esther leaves Bob's in absolute despair. When she finally gets to meet Helena, there is more disturbing information but there is also a pleasant surprise waiting for her, thanks to the action of a true best friend. The Search is a sensitive yet dynamic and informative graphic novel. Heuvel doesn't hold back on the plight of Esther to survive or atrocities Bob describes which were inflicted on the Jews in concentration camps by the Nazis, but he does temper it by framing the story in the present, and including the sons and grandsons of Esther and Helena. And even though the story jumps back and forth between past and present, it is not confusing in the least. The other nice thing is that each character is distinct from the others, so there is no confusing who is who, which can often happen in graphic novels. In part, it is because they are also drawn distinctively and a large color palette is used. 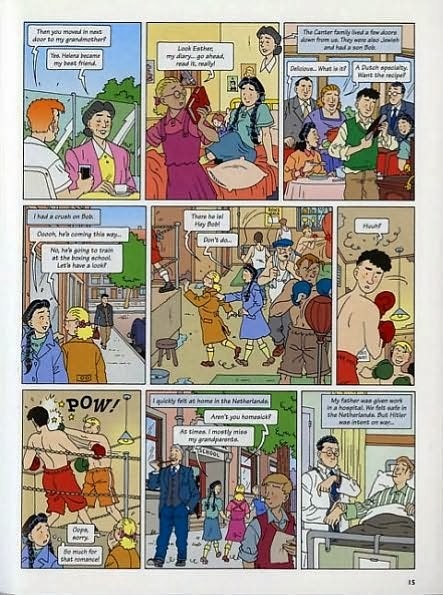 In fact, the illustrations help tell and carry the story along as they should since space is limited in graphic novels. This is a form that also appeals to young readers, making it a great way to introduce the Holocaust in either the classroom or for home schooling purposes. The Search was originally written in Dutch, but I think that the translation done by Lorraine T. Miller is quite well done, since the story doesn't feel forced nor does any of the continuity feel lost, giving the whole story a nature feeling and flow that lets the story unfold without jarring the reader. There is a companion book to The Search called A Family Secret, which is about Esther's friend Helena and which I will be reviewing soon, so watch this space. 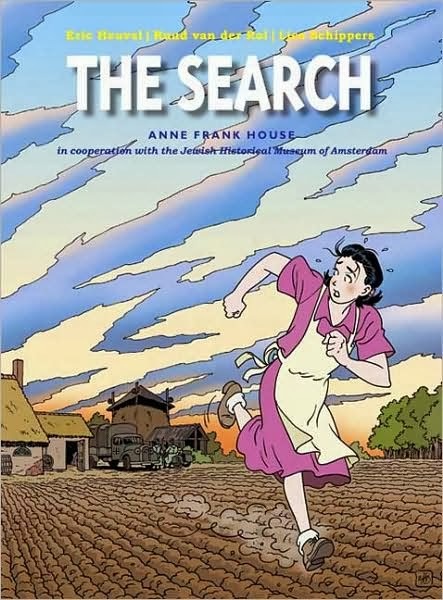 There is a helpful Teacher's Guide PDF available for The Search, A Family Secret and Anne Frank: Her Life in Words and Pictures (my review) for use together or separately. Looks like a great story. The illustration style reminds me very much of Tintin. Its interesting to see this book being done in a graphic novel style. Thanks for sharing! What a great story, just your synopsis makes me want to pick it up.